Our rats love theirs, hopefully yours will too! The underside side is pink fleece topped with soft , cream sherpa and is fitted with sturdy webbing straps and swivel clips. 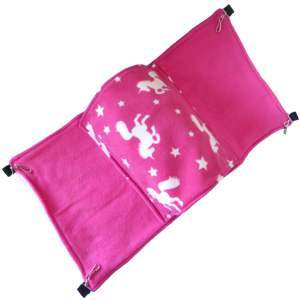 The lower deck is a double layer fleece hammock in a lovely bright pink and white unicorns and stars print, lined in plain bright pink.